Your sobriety date is the date on which you had your last drink or used drugs or placed a bet, or acted out in a compulsive-obsessive manner OR the date you sobered up or cleaned up from your last debauch. The custom followed by some AA groups of handing out small medallions called ‘chips’ (some use keytags) to mark various anniversaries of AA, CA, NA member’s sobriety dates. Many members, especially newcomers, carry a chip with them as a constant reminder of their commitment to stay sober or clean or free. Small medallions commemorating various lengths of sobriety; i.e., 1, 2, 3, 6 and 9 months; years and multiples of years. The first chip which is usually given out to a newcomer is called a ‘desire’ chip. 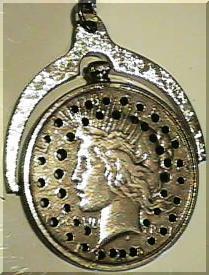 A desire chip signifies the recipient’s desire to stay sober for the next 24 hours. The traditions of chips, medallions and birthdays vary from group to group and 12 Step Fellowship to Fellowship. There is evidence that early on many people in AA carried personal momentos to remind themselves of the importance of their sobriety. Clarence H. Snyder – “The Home Brewmeister” had his last drink on February 11, 1938 and he carried a medallion (pictured right) made from a silver dollar and a watch fob up until just before his death on March 22, 1984. It has been dated back into the mid-1940’s, if not before, and the holes represent 46 years of sobriety. Clarence started AA group number 3 in Cleveland in 1939, and in the beginning had a higher recovery rate (75%-93%) than Bill and Dr. Bob combined. His story, “Home Brewmeister”, can be found on page 297 of the Big Book, Third Editiion. Sister lgnatia, the nun who helped Dr. Bob get the hospitalization program started at St. Thomas Hospital in Akron was the first person to use medallions in Alcoholics Anonymous. She gave the drunks who were leaving St. Thomas after a five day dry out a Sacred Heart Medallion and instructed them that the acceptance of the medallion signified a commitment to God, to A.A. and to recovery and that if they were going to drink, they had a responsibility to return the medallion to her before drinking. The sacred heart medallions had been used prior to A.A. by the Father Matthew Temperance Movement of the 1840’s and the Pioneers, an Irish Temperance Movement of the 1890’s. The A.A. Grapevine carried many articles on chips and cakes and the following is a brief summary of an early one that appeared in Feb. 1948. Early drunks played a lot of poker in the sober clubs. Plain, colored “chips” are still given out today by many groups around the country to signify a “desire” to stop drinking. Other colored chips represent different lengths of sobriety. What are your thoughts on sobriety birthdays? Are they a good thing or do they provide a false sense of security – a psuedo-defense against the first drink? Do medallions and sobriety birthdays put personalities before principles? It is not how long an individual has been clean/sober, I know of many individuals with years of sobriety who have still not recovered i.e. dry drunk, untreated addict. They are essentially unhappy, but have managed to stay clean. This not something I aspire to. For me, time is not the issue. I focus on whether I am recovered now. I personally do not celebrate my sobriety birthday or clean date. It has been several years now. I would much rather work with a newcomer on that day than go to a meeting where the group showers me with a lot of frothy accolades and false security. I attended a medallion meeting recently and asked the man’s sponsor, "If he is a ‘real’ cocaine addict, that is, beyond human aid, then he didn’t get clean on his own power, he got it from a Higher Power, and that power doesn’t care about "chips" or medallions. However, if he did do it on his own power then he is not a ‘real’ addict and should he really be in this fellowship?" Of course that question stirred up a bit of controversy. I suppose a sobriety birthday celebration shows the newcomer that time can be accumulated if one works this program. I do believe time accumulated is important in the first few months. But once one has recovered, which can take a few weeks to a couple months, if you work this program honestly and thoroughly, time accumulated is not really important – spiritual progress is. Chips didn’t keep me sober… the Steps did. and my unmade amends, and my unwillingness to surrender self-will to God’s will did that. I neither support nor oppose the Chips. They are little round pieces of plastic at the end of the day. Now lets get back to the 12 Steps of Recovery from addiction. Chips are a good idea, in the sense of reminding us of a desire to stay sober. Where I have a difficulty with them is that we tend to keep in mind the failures by going back to the first chip after any slip – Wouldn’t it be better to change the end date for reaching the chip the next chip to reflect the number of days the slip happened? For example: a person might be approaching their 60 day chip on May 1st and slip for two days close to that time – Would it be better to change the 60 day date to May 3rd and focus on the fact that for the first time in a long time the person had reached 58 days of sobriety without a slip? No. Deborah Jones it should not be like that. It’s about having “X” days sober consecutively. Any “slip” or relapse resets your sobriety birthday, going by the date of your last drink. And that’s the way it should be. Having said that, although the amount of sobriety you have now may have started over, that’s not to say your recovery is reset and anything before this new date erased. Even though you don’t get to claim that time before the relapse. You never lose that period of your life that you were sober, and you (hopefully) don’t lose the things you learned or experienced, friends you made and the connection with your higher power that you had in that time in your sobriety. Chips, medallions, call them what you will. We stay sober a day at a time, not from chip to chip. An old time told me that if we think we deserve a medallion to recognize our sobriety, maybe the people who never drank should get them too. We are rewarding ourselves for living normal. I personally really like the chips/medallions representation. For me, it is a goal achieved in remaining clean and sober for a certain lenght of time. Ir is also a reminder to keep “working the program” so I continue to get positive results. This goes for whether I am receiving one or someone else is. It always gives me hope. I find it to be a celebration of A.A. and the successes we are able to achieve through the Program IF we are diligent in working it consistently. Bottom line is, it is your journey of sobriety. take one or don’t take one, whatever works for you as long as you don’t pick up that drink or drug! We take the chip or cake so the newcomer can see that recovery is possible. We don’t take credit for God’s work. Clearly AA is the mother-ship program of all addictions. Can an addict who never drank but used AA 12 steps to stop, celebrate his birthday in AA? How about a gambler? What about a smoker? I attend open AA mtgs as a practice to work my outside issue that does not get the luxury of abstinence. I praise AA and do consider myself an AA member because I work the same steps and do not wish to start drinking alcohol or do drugs. But i get resentful because no one ever praised me for my abstinence in all my years “sober” or is it “dry”? I dont consider a crack addict sober if he stopped crack, but drinks every weekend; the same as i dont believe an alcoholic can say he is sober if he just beat his girlfriend. I have seen a guys get cake after such an event. Celebrating time of abstinence seems more of an ego trip when it comes down to it. None of the steps even suggest this as a practice. Why it is bad is because it creates a false sense of accomplishment, and creates a sense of expectations- which may or may not ever get met. As a result it violates the steps and traditions themselves, and probably is the cause of many shameful relapsers dying instead of returning to the program. As it is explained in the 12&12 about trad 12: anonymity expressed as humility is spiritual foundation of the program. Cakes & chips, are symbols of dogmatic religious social constructs of which AA is an alternative option; otherwise we are simply a cult using cult like tactics to brainwash members to “sanity”. Positive reinforcements can have negative consequences, AA has no such opinion on such outside matters. A person has the right to celebrate sobriety with their families and friends outside AA, but once they bring it inside then is simply “personalities over principles”. I understand everyone’s views and all on chips and tags and medallions but the fact of the matter is no one person is the same and some people have different ways that help them in their sobriety. I know a few people that have the longest clean time of anyone and they go to meetings but never worked the steps all the way through. I know people who collect their chips because it gives them a sense of pride towards them self for beating something so many people fail to beat and even die from. And on the other hand I know people who just quit and went about their everyday life. Just like anything you have to work your sobriety one day at a time however it works for you. The important thing is not what helps keep each different person sober but the fact that they are today and will work on staying that way tommarow. We as fellow addicts are supposed to help and support other addicts especially newcomers. Not bad talk the ways some people use to help themselves stay sober and feel accomplished. Some people may read those things and feel as though they should give up because they feel the way they have done is not acceptable by others and they have failed. This makes it a personal matter. To become aggravated, irritated or judgemental over someone else’so personal decision, which is a affects absolutely no one else, is a good indication your not working the steps. Sobriety chips can give one person a sense of pride or a reminder of accomplishment. It is entirely up to the individual. I could have several chips. But i only have 1 of which I am extremely proud and always carry. The 24 hour chip. My surrender coin is placed in the protective cover of my Big Book ad the 12 and 12 Book. My current coin in in my wallet so that every time I take out my wallet I see it. It does not remind me that I am an alcoholic but reminds me that I am a recovering alcoholic and in doing so gives me strength. I picked up no poker chips- they represent a gamble and once I became sober, gambling was a thing of the past. The chips work for some and not others…I believe we make a choice in our own lives. 15 years…notapokerchipone- only by Gods mercy! Tokens and rituals seem to work for many. It helped me when stressed or thinking about drinking to reach in my pocket and rub the chip as a tactile reminder of picking up the chip And celebrating sobriety with the group. Also announcing ones sobriety time can help the newcomers see that long-term sobriety is possible. The true underlying motive of a given practice should determine if it is advisable or not. Is it intended to help oneself and others, or to promote some selfish form of Glory seeking? It is a progressive program and more will be revealed as time goes on. The idea of chips and coins commemorating time abstinent from the addictive “element” is terrific when considered objectively. But the insights by others as to why this practice runs contrary to the traditions and precepts of AA are persuasive. We imagine a kindly nun saying “ok return this if you feel like drinking” in 1947 and think “Aww…”, yet, this is a manipulation no matter how well intended. If she’d been direct and said “I want to use shame and guilt here, because it’s 1947 ok and I don’t know any other way, so look, return this before you take a drink and you’ll feel at least, dumb I hope and maybe won’t drink, and if you don’t do this well then I assume you’ll feel guilty…I’ll feel better at least, either way because control is what I’m familiar with so…” I mean…in my area where in addition to the coin endlessness we have “ok everyone raise their hands with a year or more…to show the newcomer it works.” I mean, really? That’s about as persuasive as obvious as “detachment…with…love” Detachment is inherently loving because it’s a state of non-judgment. The person who in all likely hood tacked the “with love” qualifier on was probably engaged in shunning. Same here…”Hey are we being full of ourselves…” “Oh no…no it’s because well, because we want the newcomer to know it works. ” Ah. Yeah. I remember as a newcomer that was my first concern…”Wait now, ok…well…the reason I find these early stages so challenging is that…I’m not sure this WORKS…and if I pick up again it’ll be because I wasn’t sure if this WORKS…” The biographies if our founders: let the alcoholic tell his/her story and, this is a one day at a time program. A friend of mine, young, beautiful, began to put the cart before the horse. “No damn it I’m going to make a year if it’s the last thing I do I’m sick of being the only one who can’t raise her hand for a year or more…” So she made her year. She raised her hand with the others. No big shakes…she then relapsed, and I don’t know, is it fair to say when we look at “sobriety” as a club for those who have years under their belt, could it be, potentially fatal ? If the message is “oh you better not relapse because if you do everyone with time will tell you “sit down and listen” (also, not program…) Don’t know. Food for thought. Our primary purpose is to stay sober and help another alcoholic achieve sobriety. And the 12 steps are the means to spiritually achieving that purpose. Birthdays or anniversaries are wonderful and up to the individual group to consciously come together to choose how theyre celebrating. For me, at least now, anniversaries or birthdays will be about not my accomplishments by renewing my commitment to God, A.A., and recovery and if I’m going to drink I have the responsibility to return the medallion to my sponsor first. Please know I also remember the first 90 days being incredibly hard and those1, 2, 3, and 6 month coins weren’t about celebrating as much as being so incredibly thankful that I made it there; and even more thankful for the meetings every day, reading B.B. and generous grace of God/HP. I personally like the chips, they remind me I can do it and survive. And “To thine own self be true” keeps me on the straight and narrow.. Sometimes it really helps to read that and physically hold the chip. I believe.. That the amount of time a person has is valuable to them..I can acknowledge another members time sober..but its their time…I felt that first day was and still is as important as my last day hopefully all the in betweens will be better than the one before…I can’t ( though I still do at times) call a person dry or sober I got my defects and sometimes they may hang around for awhile…but being grateful for all of us should be on my heart. I now have over a decade of sobriety. Connection to God, self examination, and helping others allows me to continually see the truth about alcohol and drugs. I say this because I have relocated a few times, have a family, and still attend AA, but now am feeling a certain way about picking up medallions. The last two have been almost out of a sense of responsibility to those that know me, but now I don’t know what the purpose really would be. I guess maybe I just answered my own question. The oddity of picking up a medallion in front of a huge group of people of whom only one or two may even know who I am is weird to me. I’m not sure who the knuckle head was that started selling these chips and medilions but it’s good for those who sell them and manufacture them. Probably some drunk came up with the idea to get rich selling chips.It also generates income for alanons clubs. Like someone said earlier chips don’t keep you sober, unless it’s your ego at look at me I got 20 years sober and your ego won’t let you drink cause you don’t want to take a new comer chip. What ever you do don’t forget your A b c’s. See God could and would if He were sought. I was depressed, angry, and very unhappy (restless, irritable, and discontent). Sobriety didn’t seem worth it. I considered myself a good member in standing. Opened meetings, made coffee, chaired, greeted, GSR. I was doing what they told me to do. When was the miracle going to happen? I quit going and remained sober for another five years until I finally succumbed to the desire again. To say the least, the result wasn’t pretty. I lost everything. Long story short- I continued to struggle for another 10 years, still going to meetings the whole time. Looking back there were two things in common. One- I had not worked ALL of the steps, two- I had not worked with ANYONE. I finally was impressed enough by what I saw in someone to ask them to help me get recovered. He took me through the first 88 pages of the Big Book and I had a spiritual experience. I didn’t think it would happen but it did. I continue to work the steps in my life EVERY DAY. I also work with newcomers on a regular basis. I now can do that now. I didn’t know how to help anyone before. I was shown how by someone who was recovered. I am a living example of meeting maker DON’T make it. Do yourself a favor. Find someone who knows how to recover through working the steps. And then go help others. Your life will be changed forever.